I Am the Mummy Heb-Nefert is one of those books that took me by surprise. Ancient Egypt is a topic that I find unusual for Eve Bunting to write about, but maybe I don’t know Eve Bunting as well as I think I know her. 😉 (I have written about her books here, here, here, here, here, and here, but that certainly makes me no expert. 😉 ) As you might guess from the title, this story is told from the perspective of a mummy. Heb-Nefert was once the wife of the pharaoh’s brother, and she recounts some small details of her life as a well-to-do Egyptian woman. Her cause of death is not identified, but she describes her burial preparations as “[she] rose above [herself] and watched.” This book is written in free verse poetry, and it is poetically and descriptively written. It’s a reminder of our mortality, I suppose, more than anything else, although it does include some interesting details about life in ancient Egypt. (For example, I didn’t know that the women wore “cones of scented fat” on their heads that would melt and give off their scent in the heat, did you?) David Christiana‘s watercolor illustrations are very fitting for the story; they have a very misty, other-worldly feel. Although this book deals with a serious subject, I think it captures the feel of ancient Egypt very well. The Tomb of the Boy King by John Frank doesn’t actually fit the time period for ancient Egypt since it’s about the discovery of King Tutankhamen’s tomb, but I included it because my girls were really interested in the whole tomb business. This book is written entirely in verse form, and while this is sometimes distracting to me, I think it works well for this story. It just made me read it all the more carefully. The whole Howard Carter and Lord Carnarvon story is really engrossing, and this picture book captures the mystery and excitement of the discovery. I really like Tom Pohrt‘s illustrations in this book, too–they are detailed and colored in such a way that captures the colors of Egypt. Again, this one works well for interested or more mature listeners. 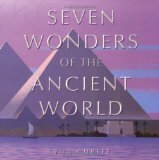 I actually didn’t discover this last book, Seven Wonders of the Ancient World written and illustrated by Lynn Curlee, until we had finished with the ancient Egyptians (for now) and were studying about ancient Babylon and Nebuchadnezzar’s gardens. However, I’m sticking it in this post since the Great Pyramid at Giza is one of the seven wonders of the ancient world. I really like this book, and since my own knowledge of the ancient world is lacking, I am learning right along with my children. Each one of the wonders has four pages devoted to it: two of text and two of illustrations. The last couple of pages are devoted to the ancient wonders drawn alongside some “modern marvels” (i.e. State of Liberty, U.S. Capitol) all drawn to scale so that we can understand the size of those ancient structures. Highly Recommended. This post is a little different because I’m really not giving all of these books a wholesale recommendation for all ages. Your own personal judgments and convictions about mythology and at what age children should be introduced to those concepts should guide you. Here at the House of Hope, my girls and I have had many, many (many) conversations about false gods, etc., and so while at times I have been a little uncomfortable personally with the stories we’ve read, Steady Eddie and I agree that over all, we like this classical method and want to man the rudder, so to speak, while we navigate these waters with our children. What’s in your read-aloud stack right now? Please share in the comments, or leave a link to your blog post. Come back tomorrow for the links, done up nice & easy, in a blog post all their own! We are reading The Robot & The Bluebird – http://www.redtedart.com/2011/02/16/kids-get-crafty-robot-cards-the-robot-the-blue-bird/ a modern take on Oscar Wilde’s Happy Prince! Great Egypt books! We enjoyed the Eve Bunting and King Tut ones last year but I didn’t know the others. I’m going to have to write down the Egyptian Diary for the next time we study Ancients (or maybe before :)). I’ve also found the false god thing to be fine for my kids. Even at a young age they easily understand that this is interesting but not what we believe. I’ve actually found that studying other religions and mythologies has given us a lot more opportunities to discuss our own beliefs, and in a way that is probably deeper and more thoughtful than we might otherwise. When we studied Egypt we talked a lot about how their concept of being judged after death and being weighed solely on their own actions vs. our knowledge of grace and how Christ’s death will cover us at the time of judgment. I think if you study ancient Egypt there is no way to avoid some of things that need to be approached carefully. Here’s mine – short & sweet this week! I love it when you focus on countries. We aren’t there yet, but when we are, I know who to come back to and reference! You are a great resource – doing all my work for me in advance. =D Thank you! The Seven Wonders of the Ancient World looks like a great book. I’ll have to remember it for when we cover Ancient history in a couple of years. We have just finished Brighty of the Grand Canyon. We loved Heb-Nefert too. We read it to celebrate Eve Bunting’s Birthday (Dec.19). We made our own mummies + my daughter had to make Nebut! I wrote about how to choose a good telling of a fairy tale and included pictures of a personal favorite. My daughter and I enjoyed Richard Platt’s Castle Diary when we were studying the Middle Ages. There was a bit of “bathroom humor” you might want to edit, as I recall. I recommend the now out-of-print color version if you can find it at the library or for a reasonable price – the new version is much smaller and black-and-white. We enjoyed some “little reads” this week. Both very cute!